These are so pretty! You can’t go wrong with black and white with a pop of color! Thanks for sharing! Stunning! love, love, love the first card. But all are amazing!!! Beautiful cards! The first card is my favorite, but they are all great. Oh My! These are fantastic!!! I love them all - thanks for the ideas!! The polka dots are calling me again. Guess I'll be buying that first. I love the black and white. So elegant! Great cards. Love the black and white! That stencil is amazing! Great cards! Polka dots and stripes never looked so great together! Wonderful cards. Love the Polka Dots and thanks for using the All That Jazz ink. I really wanted to get a close up of the color. Stunning cards! Love your color palette on all of them. I love all of the gold. Great cards you made. Love the ideas of your cards and I might have to barrow some of those ideas. Thanks for sharing and have a wonderful week. Beautiful cards, love these color combos! Your cards are all amazing. That stencil is calling my name!! Gorgeous cards! Love the colors you used! 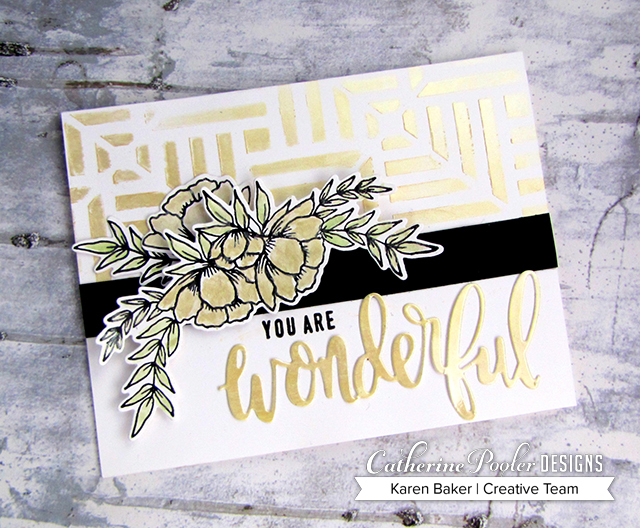 Beautiful cards Karen, they are awesome and can't go wrong with black and white and little color. Love your ideas you did on your cards. Gorgeous! Your cards are so beautiful, Karen!! 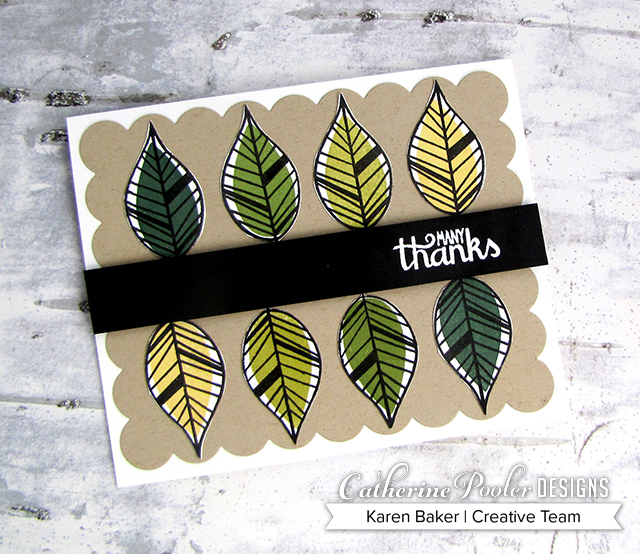 Love how you paired the Doin' the Polka Background with the patterned paper! I love the soft color palette you used on the first two cards. the black and white with the pop of blue is really nice. Beautiful cards!! I love that leaf thanks one the best! Stunning cards! Thank you for sharing. I love the leaf card!! Loved your cards....so my style and I know I can re-create. Great cards! 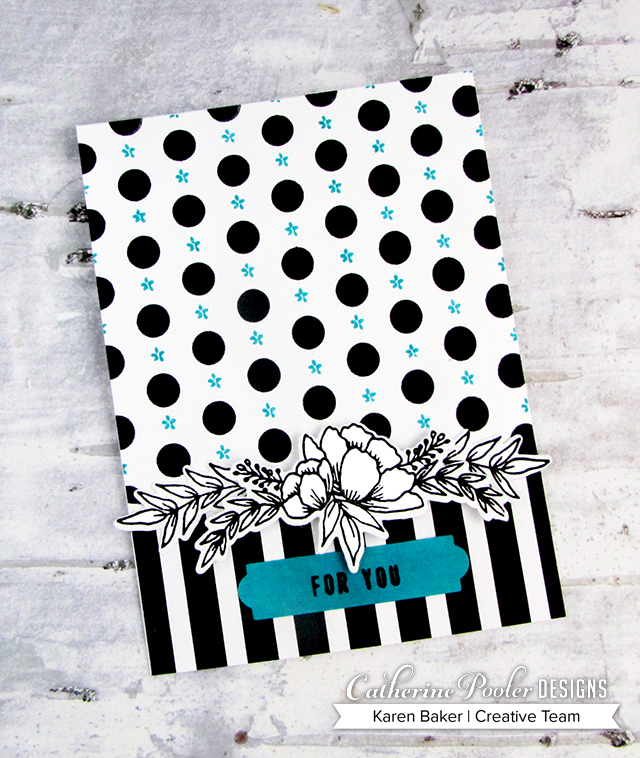 Love how you used the polka dot background stamp with the stripes from the patterned paper on the first one with just a little bit of All that Jazz to make it pop! Your cards are gorgeous, Karen! And you managed to showcase so many of the new products. 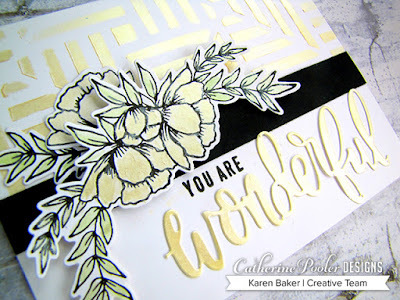 Love the hint of "All that Jazz" on the first card, the glossy gold on the second (with that elegant sprig of flowers) and the more subdued leaf card. The sand-dune base really sets off the less saturated colours of the Spa collection. These are fantastic cards ! I love the gorgeous designs of your cards! Love the All that Jazz ink! Wonderful cards! Love the touch of turquoise with the black & white on the first & then all the gold on the second. TFS. Love each of your cards equally. My favorite is the leaves card. Thanks for the inspiration. Three amazing projects Karen! 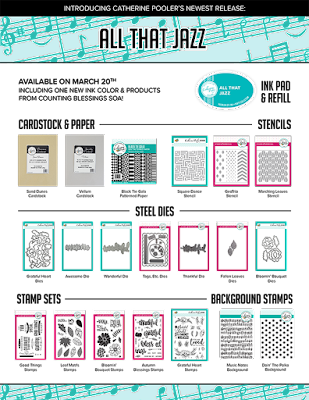 I love the use of all the new products... especially the polka dot stamp... LOVE! I love the black and white. You can't go wrong with black & white and a pop of colour!! So elegant! The color combos are awesome! Love the gold on the second card! Three totally different looks with these cards. All were stunning, and very creative. Love all three of these wonderful creations! So different & all so beautiful! Beautiful cards! Love the b&w papers and that pretty All That Jazz ink color! Fantastic cards! As I scrolled along, I thought "oh, I like that", "oh, I like that" and "oh, I LOVE that". They are all beautiful but the leaf card stole my heart. All the cards are beautiful! 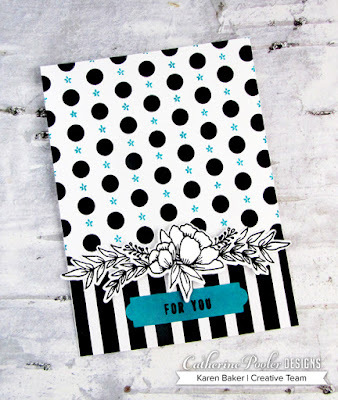 But, O how I LOVE that polka dot stamp with the patterned paper! It's fabulous!! The cards are gorgeous! Very cool and stylish. 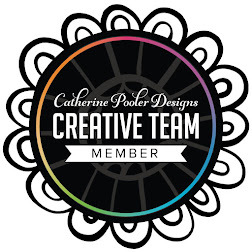 I love how you took the polka dot background and added the tiny flower that also could be stars to make your flower bough pop! Really liking your idea's on these cards, the tiny flowers are such a fabulous touch with the first card, my favourite is the leaf card, just my kind of design, love it. Love you cards! I'm crazy about polka dots. Always have been! Thanks for sharing your ideas with us. black and white so lovely together with a pop of color! Love using black and white, you can use any color to make it pop. love the black and white, so classy! Love the first card...the colors and the simplicity of it!! I love the small elements of blue that match the sentiment on the first card. It's the very definition of clean and simple! And I am going nutty about those leaves! Thank you. Beautiful cards, I don't think I could pick a favorite if I had too! Beautiful cards! The leaf one with the Many Thanks is totally my fav! Thanks for sharing! I have never used Nuvo mousse. I can't wait to give it a try. The beautiful card inspired me to use some. All three cards are beautiful Karen but I think my favorite is the second one. So classy! Wonderful cards. My fave is the first one--I like the colors. Lovely cards, I need to try the Nuvo mousse. Amazing cards, Karen! Each one has so much style and each with a little graphic flare! Such wonderful cards, Karen! The Nuvo card is my favorite! that is elegant! Im sure the shimmer is beautiful in person! Loved the poke dot background on card one. And loved the coloring of the leaves on the last card. All the cards really show great ideas for the release! Beautiful! Thanks for sharing! Your cards are all beautiful, I really like the colors of the first one, and how you added the tiny flower to the polka dot background. Fantastic cards! I love the Nuvo mousse with the stencil! 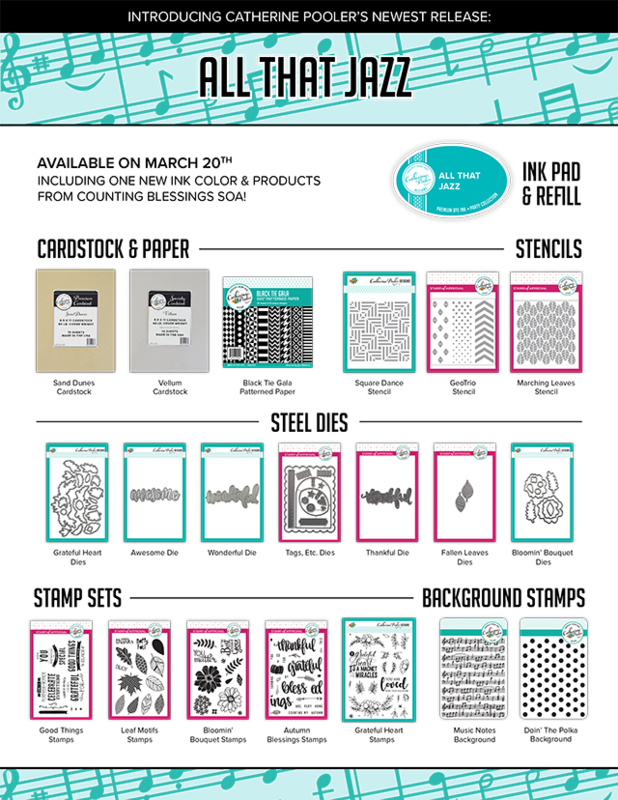 SUCH BEAUTIFUL AND CREATIVE WORK, ADORED THR BLACK, WHITE AMD BLUE CARD. Karen all fabulous and amazing cards, I need to play with my Nuvo mousse now. I has been unopened for too long now! Gorgeous cards. I love black and white and the pop of color is beautiful. That mother of pearl mousse is gorgeous! 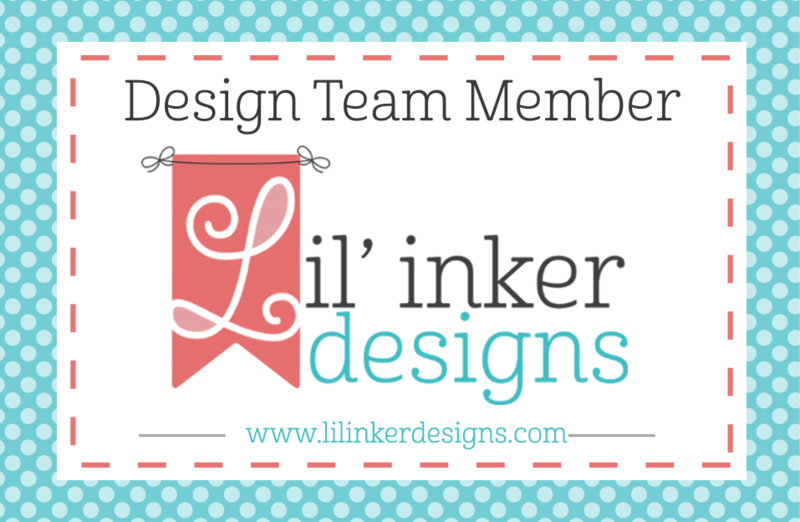 Thanks for sharing your designs! They're great. I can't pick a favorite. I love the teal you matched with black & white -- very eye catching. 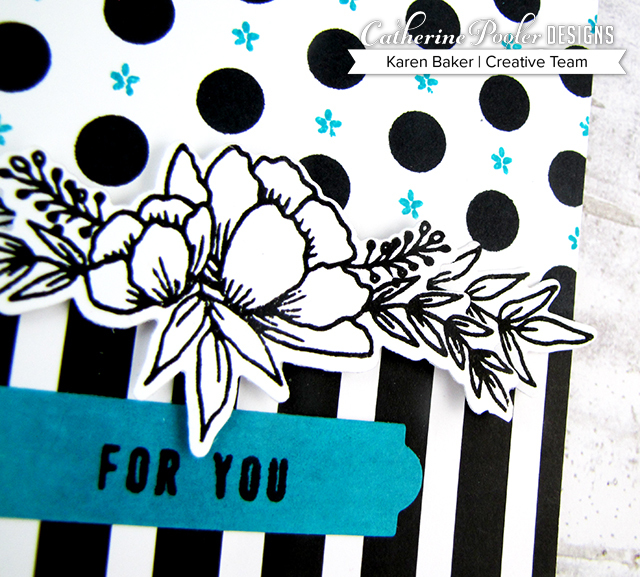 I am in love with the polka dot stamp and the added embellishment with the All that jazz ink is such a great idea! These are gorgeous designs ! Karen your cards are beautiful. Thanks for sharing. I love the limited palettes that this release is bringing out. B&W + one color is always such a classy look. That mousse one looks so amazing; I love how you colored the flowers to match. Thank you for sharing such lovely cards! Wow-the gold mousse is beautiful! All theth cards are amazing but that gold one really caught my eye! Love what you did with all three cards and there's such a huge variety and how you design each one. Love your elegant cards. Fantastic! Fabulous showcase for all these new products. I especially love your first card with the gorgeous design and the awesome colour combo black/teal. Thanks for sharing. I really like the leaf motif background! You really jazzed it up! Such pretty cards - love the flowers and the leaves. Beautiful cards, love the 50/50 idea! Beautiful. The first one is so elegant with the gold. Love the design. Grateful Heart is on my list, it is such a wonderful set. Great cards - both of them. I love the Nuvo mousse, but those leaves are adorable. amazing cards, I love them! I love your cards...all of them! These are all incredible Karen, beautifully done!